Chefs and politics are a good blend, according to the James Beard Foundation (JBF), which is holding a private boot camp in Northwest Arkansas next month to train a group of chefs in food-related public policy. The Chefs Boot Camp for Policy and Change will be held at the 21c Museum Hotel in Bentonville, Ark. Sept. 7 – 9, with 15 chefs from across the nation who applied with JBF and were selected for the program, including Bentonville chefs Bill Lyle and Case Dighero of Crystal Bridges Museum of American Art, Matt McClure of The Hive / 21c Museum Hotel and Rob Nelson of Tusk and Trotter. The event will train participating chefs on tactics needed to effect change in public policy, using the example topic of food access and affordability. Sessions include a policy briefing and practice on setting goals, establishing audiences and creating networks of supporters for a particular cause. 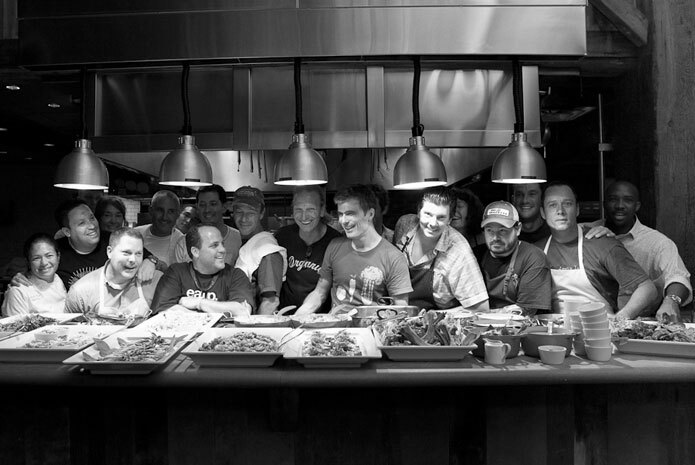 Chefs from a previous JBF Boot Camp enjoy a lighthearted collaborative dinner together. Although food access and affordability is a topic most chefs are on board with, Moon said the boot camp is mainly a springboard to help chefs champion the topics that are most important to them. Once chefs have graduated from the boot camp, they have the support of the James Beard Foundation’s Chef Action Network (CAN), which supports advocacy work through special events and communications support. Last year, Moon said, JBF and CAN started helping boot camp graduates hold salons in their own cities on topics important to them. Chefs who are interested in joining a future boot camp or otherwise getting involved with the Chef Action Network at a local event should fill out a boot camp application on the James Beard Foundation website: http://www.jamesbeard.org/education/bootcamp.